Cash Application Specialist is accountable for performing cash processing tasks and keeping the financial records organized. 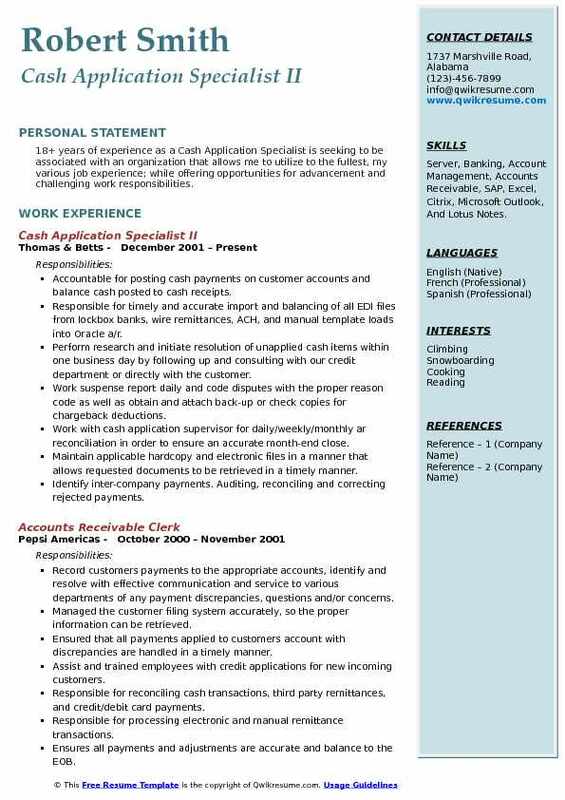 A Well-drafted Cash Application Specialist Resume emphasizes on duties such as – collecting payments, issuing receipts, refunds and invoices; answering to customer inquiries, recording client payments, ensuring payments are accurate, communicating with clients, resolving conflicts, identifying and resolving payment discrepancies, taking care of computer billing and refunds, computing bills using cash registers and calculators and solving liquidity management problems. 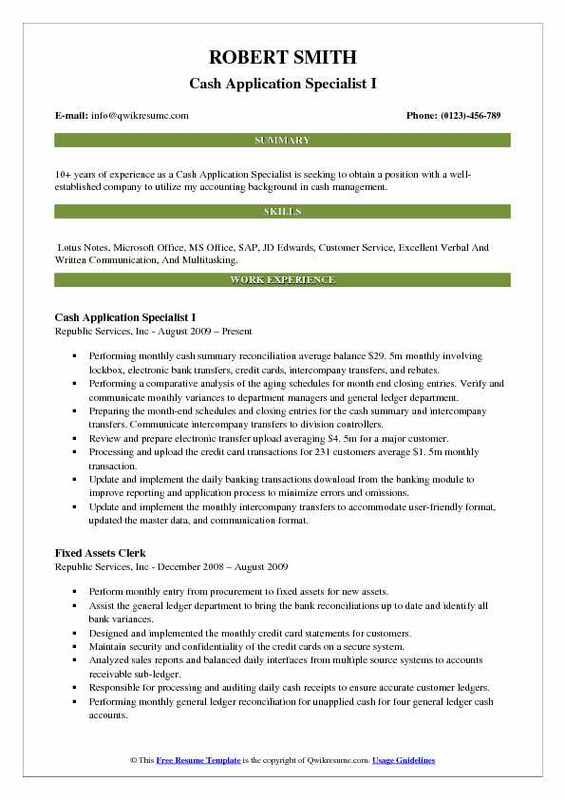 A reliable Cash Application Specialist should display in the resume qualifications such as – good math skills, accuracy, basic accounting knowledge, communication abilities and attention to details. Job applicants should have a knack for understanding and be able to deal with liquidity management problems and be proficient in using the relevant software. A high school diploma or an Associate’s degree in accounting, finance or business administration is commonly seen on most of the resumes. 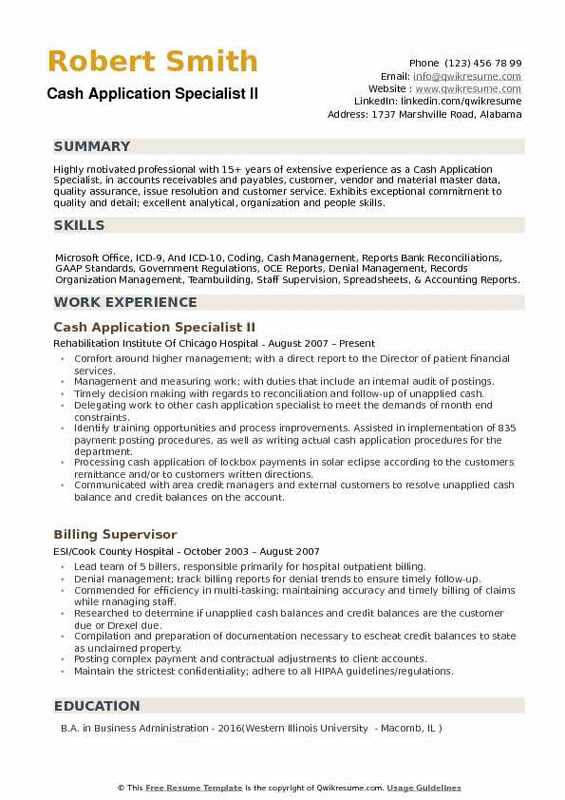 Headline : Cash Application Specialist with more than 6 years industry experience in banking and collections responsible for providing administrative and resource oversight and ensuring full compliance with all applicable state and federal rules, regulations, and laws is seeking a full-time opening in which to apply my expert skills in accounting and financial analytics. 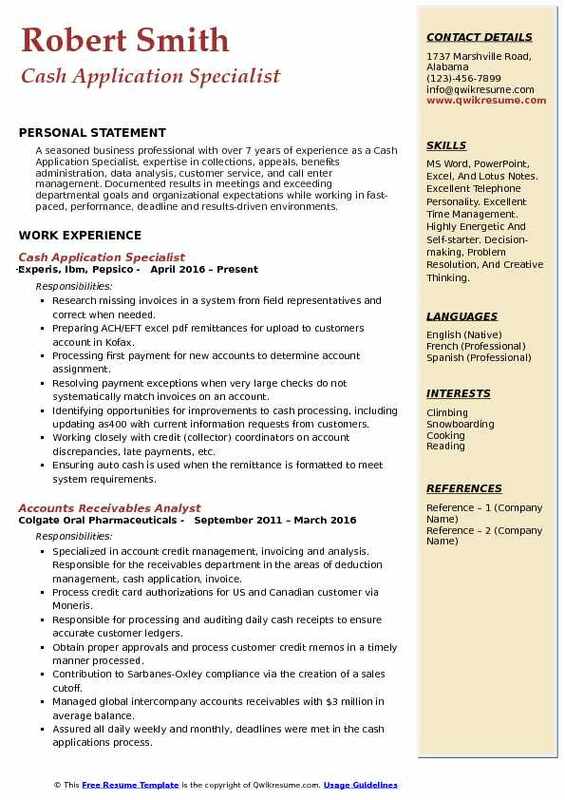 Skills : Call Center, Collections, Human Resources, Teaching, Microsoft Office, Mortgage, Lotus Notes, Customer Service, CRM, Salesforce, Excel, HRIS, Litigation, Loan Processing System, As400, Account Management, Documentation, Answering Phones, Payment Processing, Modification, Administrative Support, Research, Administrative, Finance, Training, Legal Research, And Payment Processing. Uses OCR (optical character recognition) software to apply payments to invoices on a daily basis. Identifies and analyzes all cash items not automatically posted to the accounts receivable portfolio during the automated cash application process. Researches reasons for discrepancies and/or inability to post payment. Reviews data to identify patterns and potential causes of discrepancies. Contacts core, 3pl and/or om solutions teammates, as well as customer accounts payable and materials management personnel, to resolve discrepancies so that the full customer check can be posted. Applies internet skills to access Owens minor bank account/transaction history. Ensures transactions balance in a timely manner so that proper payment is made to one or multiple parties, reviews and corrects own work, makes the correction and /or adjustments as needed. Provides guidance to the distribution center to facilitate the explanation of payment application to customers as needed. Assists in archive research when called upon. Uses various software programs such as excel, access, monarch and word to prepare remittance file documents for auto-cash processing. Identifies and analyzes repetitive problems with lockboxes or customer checks and aide with resolutions to improve the processes. Works with distribution center teammates and corporate credit managers to complete processing of customer settlements. Ensures all proper signatures and paperwork is included before processing. Provides copies of all unapplied checks with each daily automated cash application portfolio for MICR number update to help maintain a more accurate hit rate. Analyzes, researches and resolves all emails daily in accordance with each specific request (i.e., Miss- post research, missing check research, remit copy assistance, etc) to ensure all customers needs are met on a timely basis with full satisfaction. 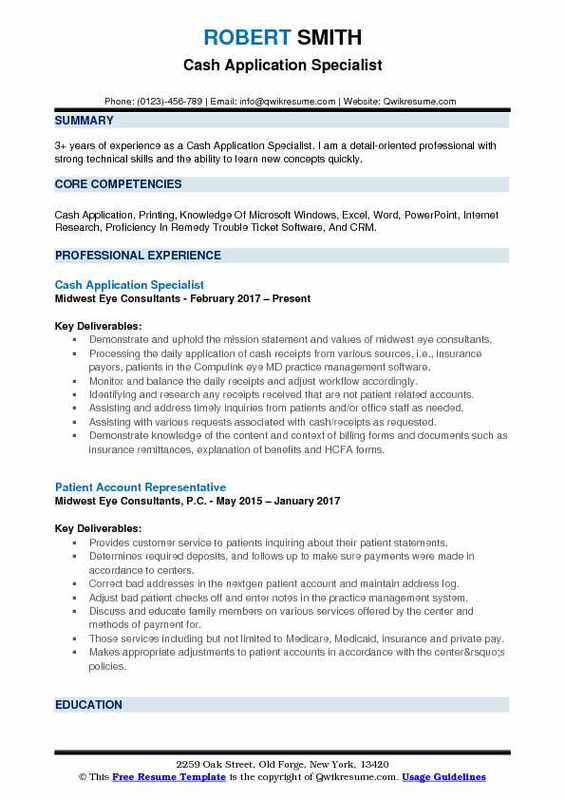 Objective : 3+ years of experience as a Cash Application Specialist. I am a detail-oriented professional with strong technical skills and the ability to learn new concepts quickly. Skills : Cash Application, Printing, Knowledge Of Microsoft Windows, Excel, Word, PowerPoint, Internet Research, Proficiency In Remedy Trouble Ticket Software, And CRM. Demonstrate and uphold the mission statement and values of midwest eye consultants. Processing the daily application of cash receipts from various sources, i.e., insurance payors, patients in the Compulink eye MD practice management software. Monitor and balance the daily receipts and adjust workflow accordingly. Identifying and research any receipts received that are not patient related accounts. Assisting and address timely inquiries from patients and/or office staff as needed. Assisting with various requests associated with cash/receipts as requested. Demonstrate knowledge of the content and context of billing forms and documents such as insurance remittances, explanation of benefits and HCFA forms. Strong knowledge of Compulink eyeMD and/or any other practice management software applications, specifically patient ledgers. Maintain strong working knowledge of third party billing and collection policies, procedures and laws. Demonstrate knowledge of insurance companies’ guidelines for claims preparation, billing, and collection. Work with ten-key calculators, computers and practice management software in a competent manner. Protect MWEC and its assets by following all billing and compliance guidelines, rules and regulations and never knowingly committing a fraudulent act. 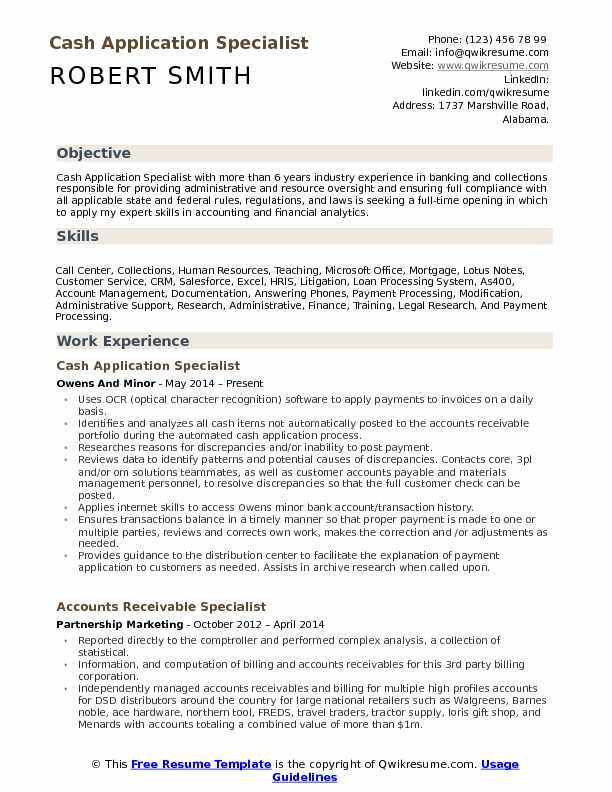 Summary : 10+ years of experience as a Cash Application Specialist is seeking to obtain a position with a well-established company to utilize my accounting background in cash management. Skills : Lotus Notes, Microsoft Office, MS Office, SAP, JD Edwards, Customer Service, Excellent Verbal And Written Communication, And Multitasking. Performing monthly cash summary reconciliation average balance $29. 5m monthly involving lockbox, electronic bank transfers, credit cards, intercompany transfers, and rebates. Performing a comparative analysis of the aging schedules for month end closing entries. Verify and communicate monthly variances to department managers and general ledger department. Preparing the month-end schedules and closing entries for the cash summary and intercompany transfers. Communicate intercompany transfers to division controllers. Review and prepare electronic transfer upload averaging $4. 5m for a major customer. Processing and upload the credit card transactions for 231 customers average $1. 5m monthly transaction. Update and implement the daily banking transactions download from the banking module to improve reporting and application process to minimize errors and omissions. Update and implement the monthly intercompany transfers to accommodate user-friendly format, updated the master data, and communication format. Participate in the design process to implement a new credit card system. Providing assistance in the transition to the new credit card system by identifying 4,000 accounts. Currently, maintain over 5,000 accounts updated on a regular basis. Performing daily research requests for division personnel, locate and identify funds received to transfer via a batch entry averaging 500 transactions per month. Train new hires in cash applications, research, confidentiality, reporting, and support documentation for all checks. Summary : To obtain a challenging position that will allow me to utilize my relevant work experience of 9+ years as a Cash Application Specialist, Deduction Analysis and use my educational background in Economics. Skills : Knowledge Of Microsoft Windows, Excel, Word, PowerPoint, Internet Research, Proficiency In Remedy Trouble Ticket Software, CRM, SAP, PeopleSoft, Salesforce, AS400, SUS, High Radius, Sysco Account Center, Zion Bank, and Bill Fire. Post revenue transactions including charge, payment, adjustment, denial and refund transactions to the billing system. Reimburse petty cash payments to employees and report documentation to the finance department. Perform cashier responsibilities at the hospital, including making a change, accepting payments from patients and employees, cash pickup and reconciling clinical department cash, check and credit card totals. Download bank files, report on cash sheet and provide documentation to the finance department. Assuring all monthly, weekly and daily deadlines are met in the cash applications process. Maintaining speed and accuracy levels as determined by the department supervisor. Working independently within the hospital when performing cashiering and revenue transactions, coordinating various revenue transactions with the clinical department, coding, billing and Lahey patients. Ensuring that charges and balances are posted using the proper transaction codes and payer class, and that balances are transferred to the appropriate payor class. Working closely with the clinical department and coding staff to capture, code and record billable services with stringent time standards. Assisting in the determination of goals and priorities within the department. Maintaining good relationships with internal departments and external vendors/patients. 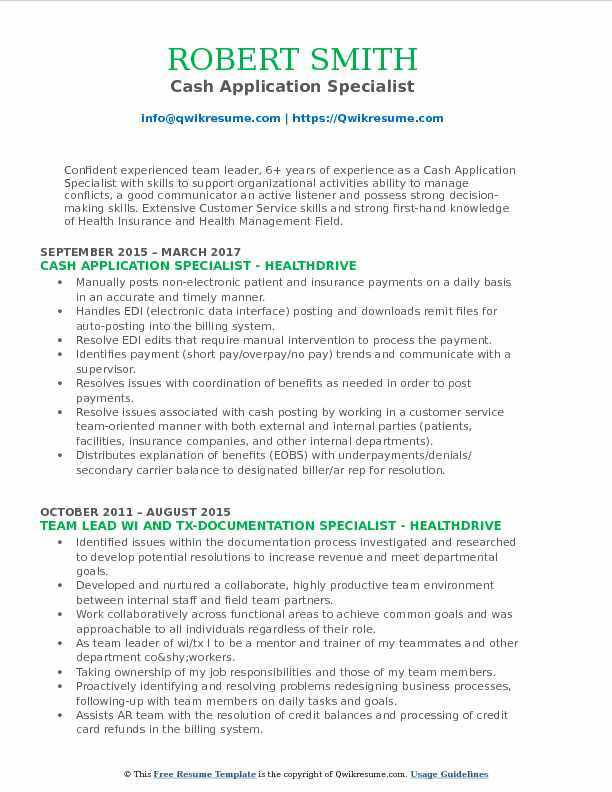 Summary : 18+ years of experience as a Cash Application Specialist is seeking to be associated with an organization that allows me to utilize to the fullest, my various job experience; while offering opportunities for advancement and challenging work responsibilities. 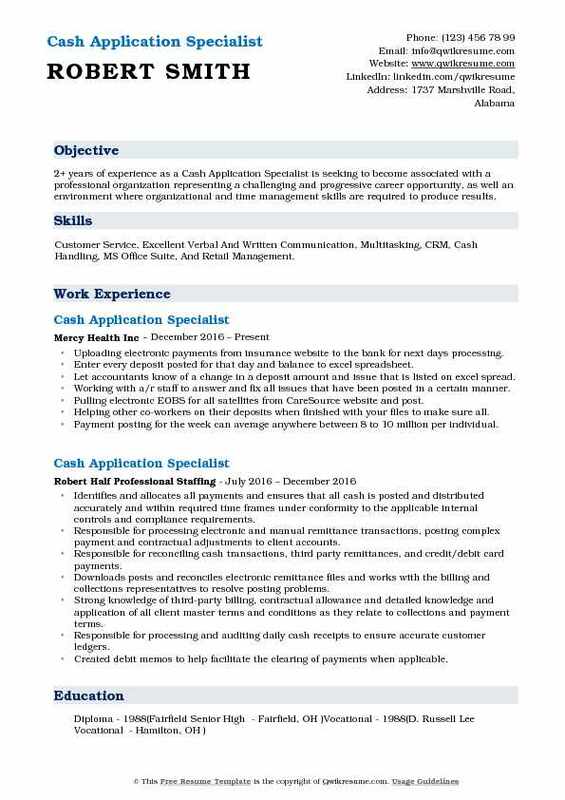 Skills : Server, Banking, Account Management, Accounts Receivable, SAP, Excel, Citrix, Microsoft Outlook, And Lotus Notes. Accountable for posting cash payments on customer accounts and balance cash posted to cash receipts. Responsible for timely and accurate import and balancing of all EDI files from lockbox banks, wire remittances, ACH, and manual template loads into Oracle a/r. Perform research and initiate resolution of unapplied cash items within one business day by following up and consulting with our credit department or directly with the customer. Work suspense report daily and code disputes with the proper reason code as well as obtain and attach back-up or check copies for chargeback deductions. Work with cash application supervisor for daily/weekly/monthly ar reconciliation in order to ensure an accurate month-end close. Maintain applicable hardcopy and electronic files in a manner that allows requested documents to be retrieved in a timely manner. Identify inter-company payments. Auditing, reconciling and correcting rejected payments. Process customers credit card payments on the PayPal website and apply those payments to the customers account to ensure proper shipments. Maintain customer master file by updating remittance and setting up new customers. Objective : 2+ years of experience as a Cash Application Specialist is seeking to become associated with a professional organization representing a challenging and progressive career opportunity, as well an environment where organizational and time management skills are required to produce results. Skills : Customer Service, Excellent Verbal And Written Communication, Multitasking, CRM, Cash Handling, MS Office Suite, And Retail Management. Uploading electronic payments from insurance website to the bank for next days processing. Enter every deposit posted for that day and balance to excel spreadsheet. Let accountants know of a change in a deposit amount and issue that is listed on excel spread. Working with a/r staff to answer and fix all issues that have been posted in a certain manner. Pulling electronic EOBS for all satellites from CareSource website and post. Helping other co-workers on their deposits when finished with your files to make sure all. Payment posting for the week can average anywhere between 8 to 10 million per individual. Working with the credit department when a patient or insurance company has overpaid. All deposits that come in daily from the bank must be posted the same day and post an excel spreadsheet or in the unapplied account. Headline : Confident experienced team leader, 6+ years of experience as a Cash Application Specialist with skills to support organizational activities ability to manage conflicts, a good communicator an active listener and possess strong decision-making skills. Extensive Customer Service skills and strong first-hand knowledge of Health Insurance and Health Management Field. Skills : Active Listener, Analytically, Detailed Oriented, Self-motivator, Accounting, CRM, MS Office, SAP, Lotus Notes, Training, And Problem Solving. Manually posts non-electronic patient and insurance payments on a daily basis in an accurate and timely manner. Handles EDI (electronic data interface) posting and downloads remit files for auto-posting into the billing system. Resolve EDI edits that require manual intervention to process the payment. Identifies payment (short pay/overpay/no pay) trends and communicate with a supervisor. Resolves issues with coordination of benefits as needed in order to post payments. Resolve issues associated with cash posting by working in a customer service team-oriented manner with both external and internal parties (patients, facilities, insurance companies, and other internal departments). Distributes explanation of benefits (EOBS) with underpayments/denials/ secondary carrier balance to designated biller/ar rep for resolution. Responsible for processing electronic and manual remittance transactions. 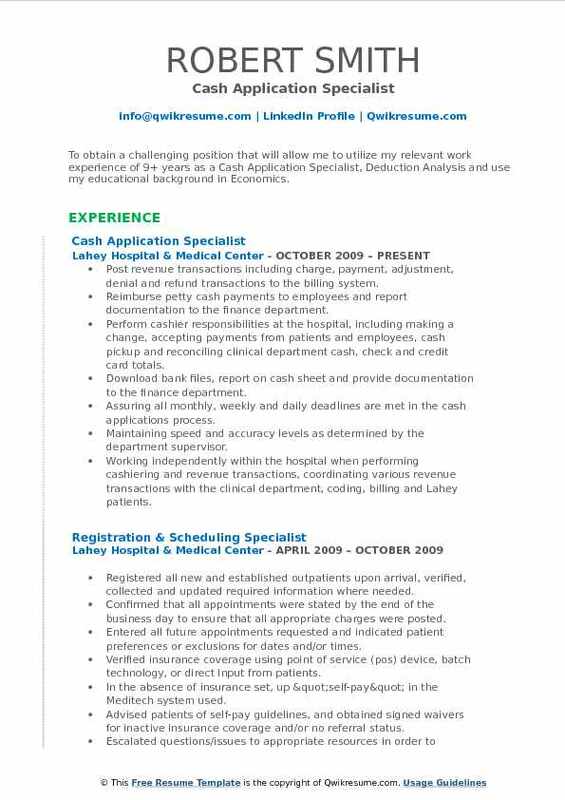 Summary : More than 10 years of experience as a Cash Application Specialist. Ability to work independently and multitask effectively in fast-paced environments. Excellent telephone, computer, problem-solving and organizational skills. Skills : Collections, Credit, Cash Application, JD EDWARDS, Training, SAP, Excel, Citrix, Microsoft Outlook, Lotus Notes, And MS Office. Managing all aspects related to the timely filing of claims including correcting claim errors and re-filing. Capture payment information from multiple systems for proper payment posting. Performing patient pre-admission, admission, transfer, and discharge activities. Obtaining signatures for financial responsibility and treatment procedures from patients or guardians. Working in compliance with hospital policies and procedures and adhere to government regulations. Responsible for reviewing and completing quarterly reports for acute care and physician billing. Researching and completing refund overpayments for insurance companies and patients. Summary : A seasoned business professional with over 7 years of experience as a Cash Application Specialist, expertise in collections, appeals, benefits administration, data analysis, customer service, and call enter management. Documented results in meetings and exceeding departmental goals and organizational expectations while working in fast-paced, performance, deadline and results-driven environments. Skills : MS Word, PowerPoint, Excel, And Lotus Notes. Excellent Telephone Personality. Excellent Time Management. Highly Energetic And Self-starter. Decision-making, Problem Resolution, And Creative Thinking. Research missing invoices in a system from field representatives and correct when needed. Preparing ACH/EFT excel pdf remittances for upload to customers account in Kofax. Processing first payment for new accounts to determine account assignment. Resolving payment exceptions when very large checks do not systematically match invoices on an account. Identifying opportunities for improvements to cash processing, including updating as400 with current information requests from customers. Working closely with credit (collector) coordinators on account discrepancies, late payments, etc. Ensuring auto cash is used when the remittance is formatted to meet system requirements. Managing accounts to prevent multiple movements of payments to sub-accounts. Summary : Highly motivated professional with 15+ years of extensive experience as a Cash Application Specialist, in accounts receivables and payables, customer, vendor and material master data, quality assurance, issue resolution and customer service. Exhibits exceptional commitment to quality and detail; excellent analytical, organization and people skills. 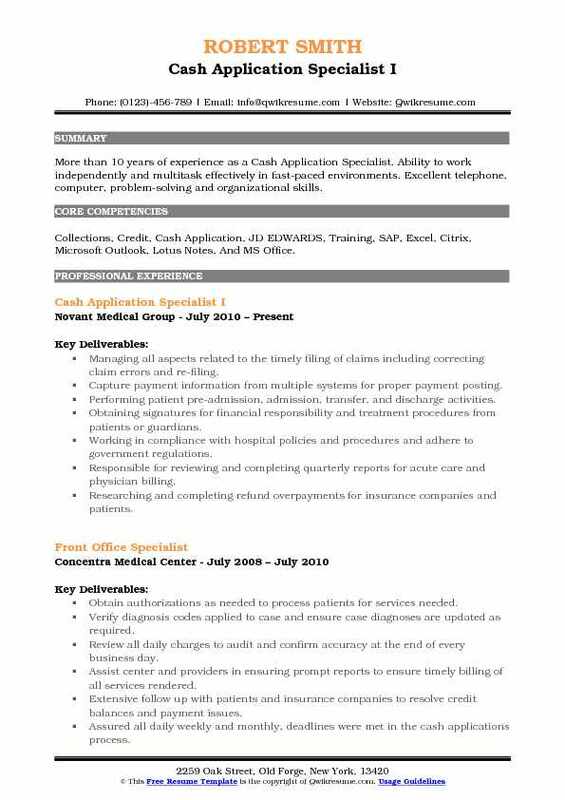 Skills : Microsoft Office, ICD-9, And ICD-10, Coding, Cash Management, Reports Bank Reconciliations, GAAP Standards, Government Regulations, OCE Reports, Denial Management, Records Organization Management, Teambuilding, Staff Supervision, Spreadsheets, & Accounting Reports. Comfort around higher management; with a direct report to the Director of patient financial services. Management and measuring work; with duties that include an internal audit of postings. Timely decision making with regards to reconciliation and follow-up of unapplied cash. Delegating work to other cash application specialist to meet the demands of month end constraints. Identify training opportunities and process improvements. Assisted in implementation of 835 payment posting procedures, as well as writing actual cash application procedures for the department. Processing cash application of lockbox payments in solar eclipse according to the customers' remittance and/or to customers' written directions. Communicated with area credit managers and external customers to resolve unapplied cash balance and credit balances on the account. Corrects errors, including misapplied payments, reversed late charges and over payments.